Our technique: Whatever it takes. 0100 hours. Stephanie finally arrives after her Duluth-Minneapolis flight is cancelled and she has to drive like a bat out of hell to catch her Minneapolis-Raleigh flight. 0200 hours. Stephanie and Susan finally go to sleep, exhausted on the one hand, and filled with anticipation on the other. 0900 hours. The fans wake up to a beautiful day. 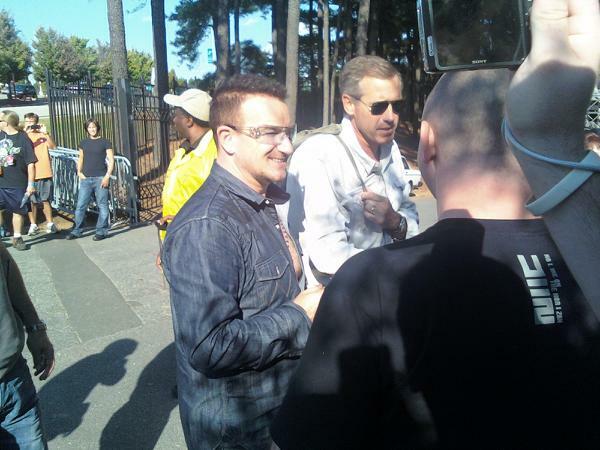 Will today be the day they finally meet Bono? The man himself? Could it actually happen? Susan has gotten inside info from Cincy friend Deb about meeting the band outside the hotel, so this is where the Raleigh fans begin. First to the front desk. Asking if they know where the band would have stayed last night. After asking three people, get a small lead to the Downtown Marriott. The Bono Fans eye him carefully, considering the veracity of his words. They walk around the corner and sit at a table to consider their next move. After a few inquiries and phone calls to local radio stations to see if they can obtain press passes since they both are bloggers, they have to move on without passes. 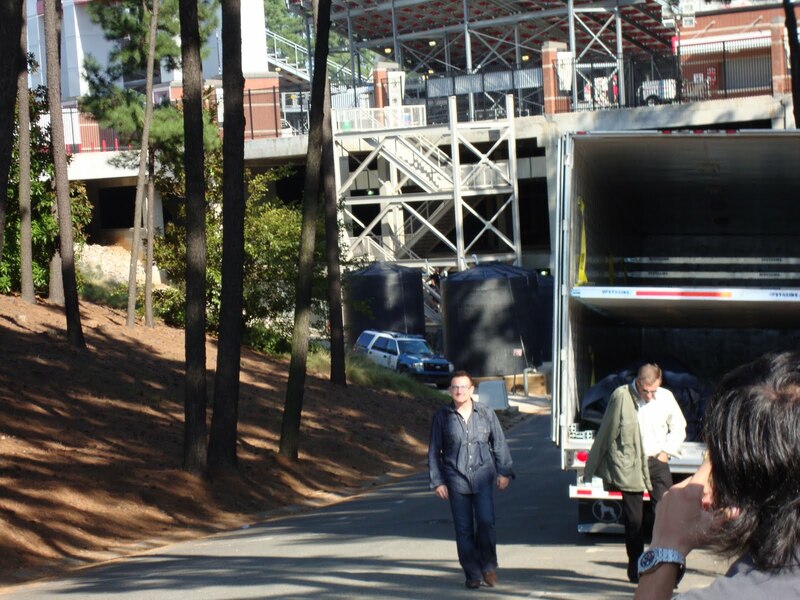 OK. Next stop: Carter-Finley Stadium, site of the upcoming concert. Having already grilled one parking attendant at the stadium, 1A and 1B discover that the band will probably enter the stadium through the underground tunnel. Next step: find a parking place that doesn’t cost $20 and is open before 3 pm and find the tunnel. Ah, here we are on Peter Hermanos Junior Drive, on the approximate correct side of the stadium. And what’s this? A little parking lot, with no “NO Parking This Means You” signs? 1A and 1B pull in as another car pulls out and informs them that this is where one parks for will-call tickets. Sounds good. They park. 1A assures 1B at least 50 times that it is ok to park here. With their goal in mind, The Fans stride purposefully forth to ask the attendant where the will-call office is. No one said they actually needed tickets, did they?? 1A and 1B can feel they are getting closer to the right place. Their next interrogation is of a security guard who says this is Vegas for these two fans and that what happens in Vegas stays in Vegas. I forgot to tell him I have a blog. The security guard can’t tell us anything. Except that somehow we convince him that we are not crazy people and we can be trusted, so he gives us a really big hint about where the band is right now. I listen carefully because 1B is still distracted because she is worrying that the car will be towed away. I reassure her 50 more times that it will not be towed. We come upon an area that looks suspiciously like an underground entrance. We approach the security guard, but he is having none of our jocular banter, telling us he’s heard it all before, whatever THAT means. But we think we have hit the mother lode here. 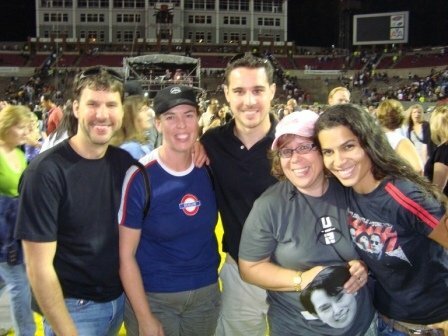 We see two guys across the way: By now we are completely comfortable going up to complete strangers to find out whatever we can in our quest to meet Bono. We walk over to the guys. I ask: “Hi. What are you guys doing?” And thus begins a beautiful friendship. We thought we were Bono Fan #1 and #2, but we’re definitely going to have get in line behind these two, who have met the man multiple times. 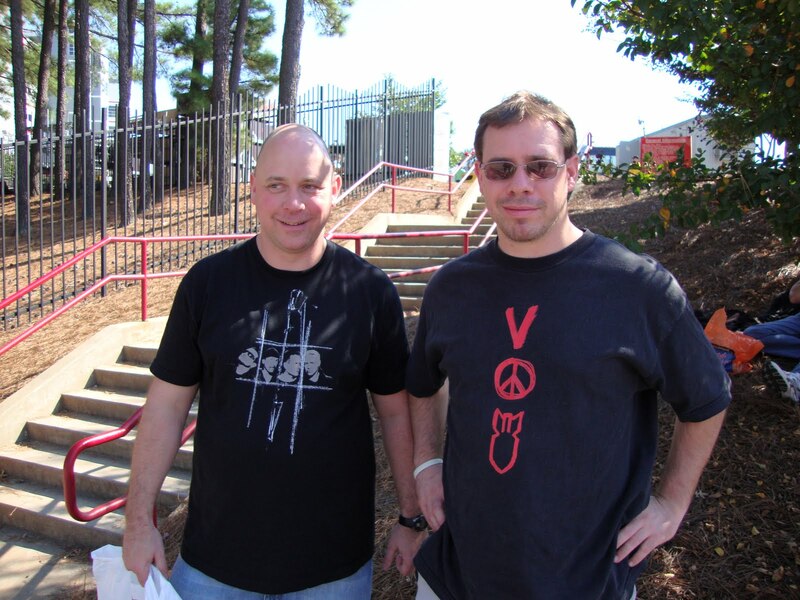 These gracious guys, John and Robert, share their curb with us, and regale us with their U2 stories. We meet them around 1400 hours and settle in for the wait. Finally, about 415 (forget the military time, I’m too excited by now!) we notice a lot more police activity, and we believe the band is about to arrive. We have a good vantage point. We are in the right place, as I keep telling my friends. I am completely confident that Bono is going to stop and talk to us. 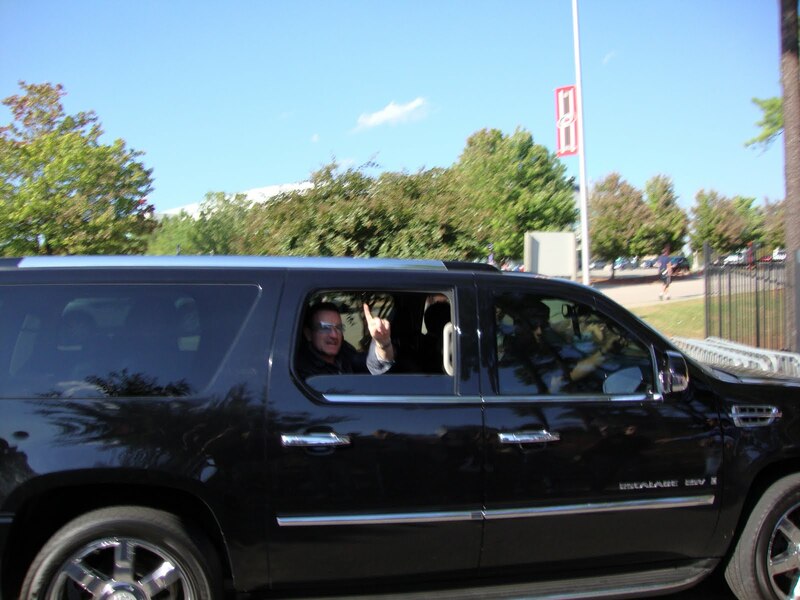 As if he has heard me, Bono drives by, rolls down the window, and indicates that he will be back in a few minutes. Although John and Robert, and Stephanie and I have been here for hours, there are those fans who find a way to cut line ahead of us. 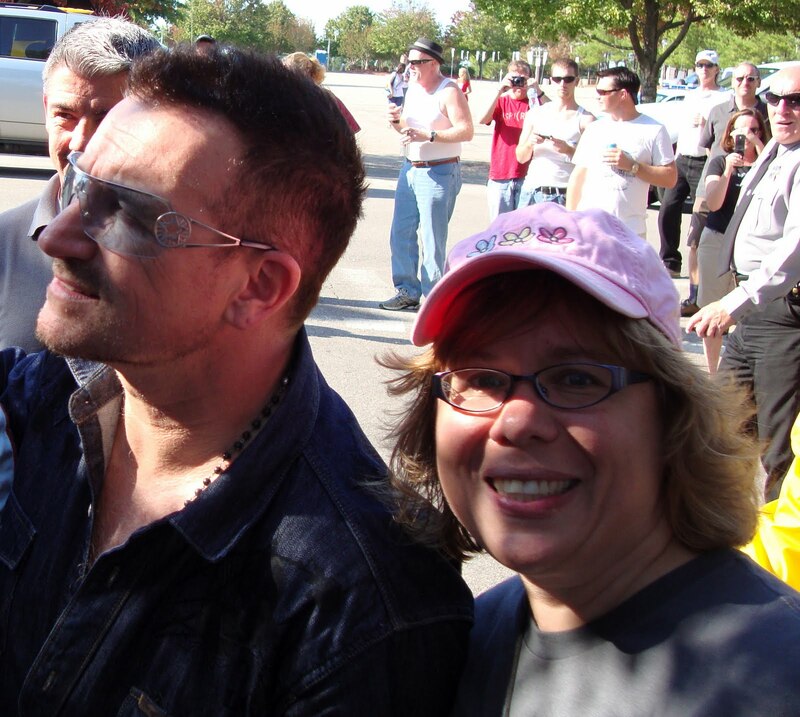 So, Bono first stops to take a picture with a woman who is shaking with excitement. After her, John is next. John is in the military and Bono perks up when he hears that. He personalizes a photo that John has of himself with Bono in Boston. He signs Robert’s Rolling Stone magazine. General Admission tickets this time, and we wanted to be close but not too close. We ended up in a perfect spot and made new friends Stefan, Cleidy, and Ben, from Germany, Brazil, and France. We thought WE had come a long way for the concert! Here are the five of us. From beginning to end this was a wonderful day. The concert was fantastic. The moon was full. The friendship was warm. The weather was beautiful. The band was U2. And I was there. love that conclusion. love that you met the guy. I'm so jealous but also so happy for you. You ROCK sissy! You are brave! You are bold! 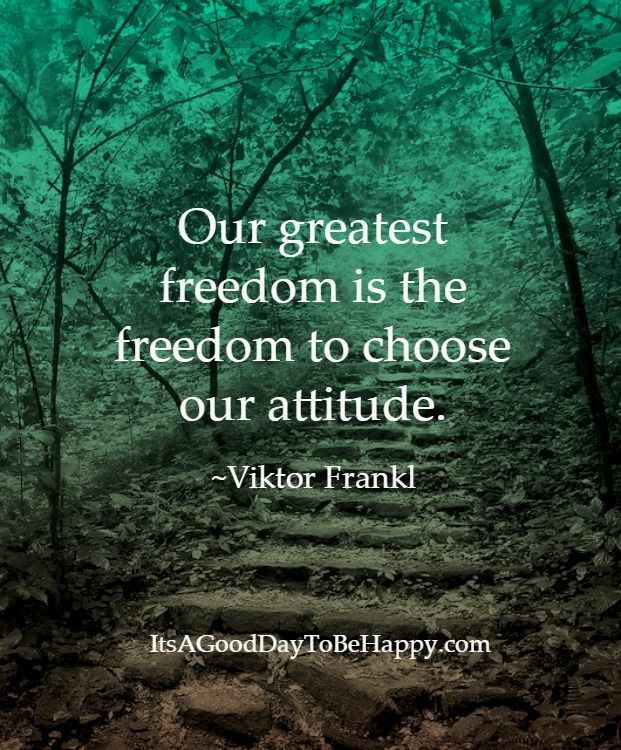 You are adventurous! You've come a long way, haven't you? And that is a great photo of the Five Friends, The 360 Fellowship. You know, you are the coolest mom/woman I know. Thanks for blogging about this. It's going to make me smile all evening. great blog account – I felt like I was there. Oh I was. Uh minus the fantastic Bono meeting part. We waved to you all – didn't you see us? We thought you were just following Bono's lead when you were waving! Oh man! Its so fun to reread that experience. Thank you! Still enjoyed reading about our adventure even tho 3 years have passed! Thank you for reminding me!! Love it! Bono. Le sigh.